UNITE-HERE! Si, Se Puede ! Harvard Labor this month. Security guards working under contract for Harvard get top billing because they were out flyering when I got off the T this morning. They are “indirect” employees of Harvard. That’s HarvMinSpeak for workers whose jobs are at Harvard, but they are technically employees of agencies that contract with Harvard. They are subject to the strongest tool Harvard has in it’s almost fourty year long campaign to drive the Union movement out of Harvard. Their contract expires this Friday Sept. 23, 2011. Two Crimson articles by Mercer Cook provide good background to recent events on the Labor front. 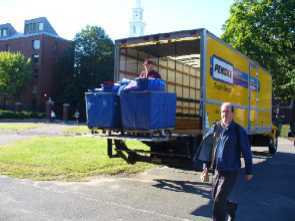 First we have a small action of “direct” employee custodial workers at Harvard Law School. The second article describes the successful negotiation of a new contract for UNIT-HERE! i.e. 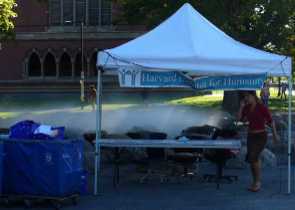 Harvard’s cooks. Normally when anyone connected in any way with Harvard declares a moral victory, I get nervous. But you can take Ed Childs’ word to the Credit Union. * OOPS! Dining Service Worker contract is not a done deal! 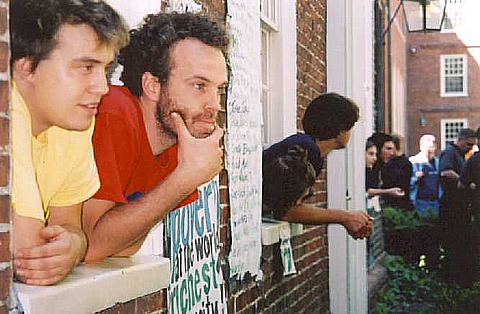 In both cases a significant role was played by the Harvard Student Labor Action Movement. Y’all come back now! hear? September 5th is more than just another holiday. We march to honor the history of working people and to continue the fight for a just economy for all! We will be marching through Harvard University to highlight the struggles of workers and our communities. Gather at the end of the march at 11am to support workers and listen to speakers. 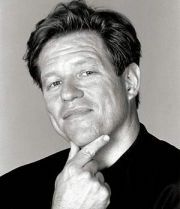 Enjoy entertainment by the band HUMANWINE, musician Chris Pahud and comedian Jimmy Tingle! *If you are near Harvard Square, you can meet the students of the Student Labor Action Movement at 9:30 AM at Phillips Brooks House. I thought he was talking about somebody’s mother, but ¡Ya basta! ‘means roughly ‘Enough is enough! 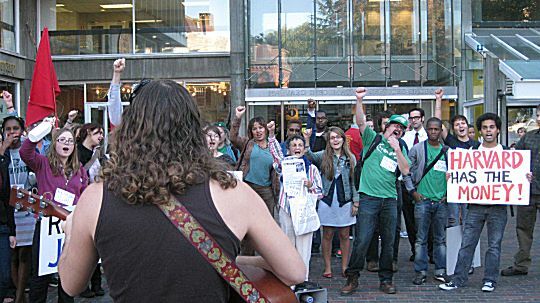 Offered by local singer-songwriter Evan Greer to a rally for fired Harvard worker Joan Frankel, it energized the first labor action of the new term. I could say more, but there was a lot of ‘alternative media’ coverage. I’ll link it as it appears. 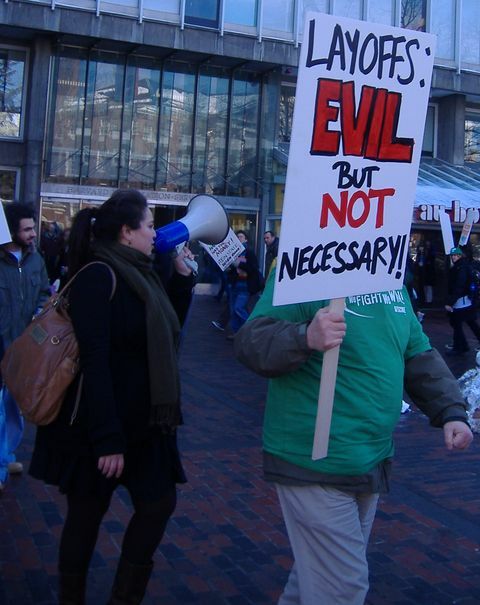 Jason Pramas has a nice slideshow and report of the rally at Open Media Boston. Tara Merrigan of the Crimson has a text report. I am remiss in reporting the last labor action of the last term. The Harvard Student Labor Action Movement had a “Walk with Workers” which had a “Bread and Roses” theme. It was covered by the Crimson, but I can show you more pictures :). Rally in support of Joan Frankel @ Holyoke Center, Harvard. Joan Frankel, a 25 year employee of what was the Division of Applied Science, has been told that she’s terminated next Wedesday. Perhaps not with ‘Extreme prejudice’ as in ‘Apocalypse Now’, but despite A+ performance ratings upto and including June 2009, she’s being fast tracked for dismissal. Joan is a member in good standing of the Harvard Union of Clerical and Technical Workers, also known as the American Federation of State County and Municipal Employees Local 3650. Labor from Harvard and beyond, gathered in support of her in front of Harvard’s Holyoke Center. When she came to an anonymous question asking for more financial and accounting assistants, Murray asked, “That was you, Harry, wasn’t it?” causing Associate Dean of Finances Harry E. Dumay to smile and shake his head amid laughter. Whether it was Harry or not, somebody thought the financial office was understaffed. But to fire it’s most experienced [and ‘expensive’] employee and hire perhaps two younger [and ‘less expensive’] people is short sighted at best. Joan Frankel in front of Pierce Hall where she works. 1If necessary, I apologize to the Indian community, by which I mean Professor Homi et.al. Science is ultimately metaphor. Religion pertains to the provably unliteral. I rather like the idea that I am a tributary of the same stream as you. It is less embarassing than the idea that the Deity created Laws of Combustion and then violated them to prove He [:)] was there. But I had to satisfy a most fundamental urge – the pursuit of comedy. II. Ratification Election of the HUCTW Contract. Work Security contract language has improved infinitesimally over it’s grossly inadequate form in 2001. Work Security in actual practice, as anyone who reads the Crimson knows, has gotten dramatically worse is likely to continue in that direction. More real soon now. Y’all come back now, hear? … and has a floral accompaniment at the moment. 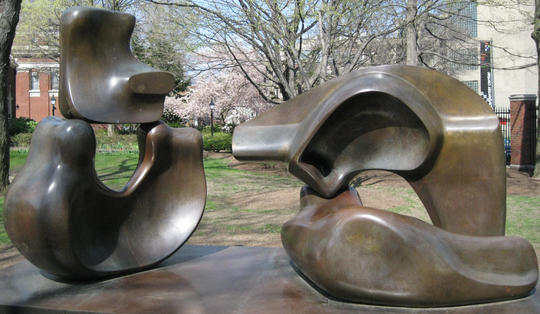 John A. Collins tells me that the space in the middle is supposed to represent the space that the sculptor played in as an infant. A protected space formed by his mother with her body. The Lamont Librarian used to take a working lunch in that space. She was fair and wore pastel floral prints. She blended. Harvard Magazine told us who figured out when and how to frock and that it is now waxed rather than lacquered. But who actually puts the frock on and takes it off. How often is the statue waxed and who does the waxing? Do they get a living wage? When I know, you’ll know. 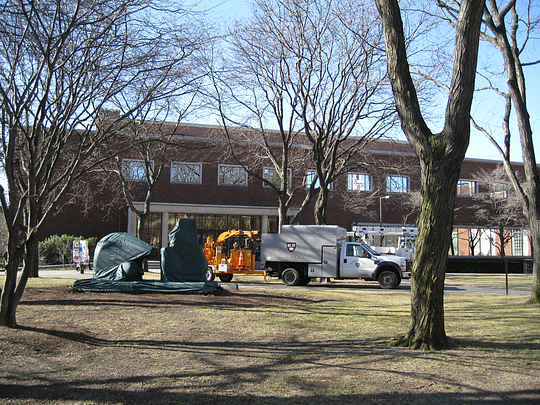 Scholars using the Lamont Library at Harvard today are advised that tree work is being done near the entrance. While an ever increasing amount of work in the Yard is being outsourced. This particular work is being done by Harvard ‘direct employees’. Consultation between a worker from Facilities Maintenance Operations and a patrol officer from the Harvard University Police has led to a carefully designed cordon of yellow caution tape around the affected area. Please take it seriously as a measure to prevent injury from falling debris. Also, please take seriously any advisories from the HUPD officer. Harvard administrators may be more concerned about protecting The Endowment than protecting you, but Harvard Labor cares about you. Thank you. A brief campaign statement to the Harvard Community and specifically denizens of FAS Arts who I propose to represent on the Executive Board of HUCTW. The Late Larry Summers1 had a model for the expansion of Harvard based on a significant shift in the political economy of the University. I once quite loudly suggested that he was planning to divest the Faculty of Arts and Sciences because it was a cost center and not a profit center. I was told by sympathetic, but more timid people to lower my voice and that what I had suggested was too nearly true to be funny. Of course, the North Academic Complex is clear evidence that he had no intention of deprecating the Science portion of FAS. His top level idea was to favor the departments in any faculty that could increase the inflow of ‘soft money’ i.e. research contracts. Watson of Double Helix fame, said that the Late Larry told him he favored medical research over basic biology because the former were ‘winners’ and the later ‘losers’. The plan was to convert endowment paper into buildings and use them to house income producing research. Leaving aside for a moment the question of the recent history of capitalism, the question is, now that Larry is gone, has the plan really changed? Certainly it has been slowed. The first part of the question is, how much of the ‘fiscal austerity’ of the present is related to hopes of reviving the growth plan? The second part, and the one that affects FAS Arts most strongly is what’s going to happen to all those ‘losers’ in the Arts – where Arts is understood to mean The Humanities. The Late Larry’s approach to “The Two Cultures” problem was to divest one of them2. What does the future hold? So while, the HUCTW members in the libraries are under the most serious threat, those in FAS Arts are not far behind. At the very least, we need a much stronger effort towards job security. As citizens of the Commonwealth and the World, which presumably Harvard serves, we have a right to weigh in on Harvard’s future. 2And to compound his error, he regarded economics as a ‘social science’ as opposed to the dismal excuse for a science that it is. A brief campaign statement for the position of Union Representative in the Harvard College Library. 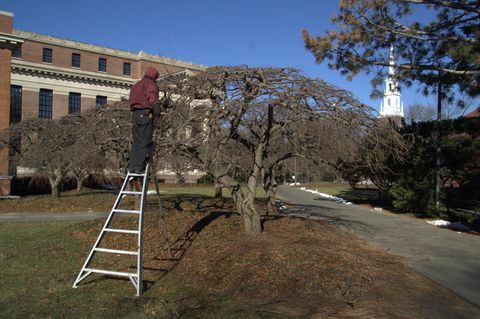 Just before the first snow of the year, a new University Task Force Report drifted down upon the Harvard campus. This one, sponsored by the University Provost Dr. Stephen Hyman is about the Libraries – all 73 of them which President Drew has called a scandal. The management of the Harvard Libraries needs to change to address the crisis ofcapitalism The Endowment and the challenge of the internets. What are the proposed changes, who will be affected, and how? The Task Force sought to deal in sweeping generalities. They have handed in their report leaving implementation details to The Implementation Group. One of two serious problems with the report is the total neglect of any consideration of Green House Gas Emissions. A major revamp of the libraries, which of necessity will require redirection of substantial fixed as well as variable capital should include as a constraint, the reduction of GHG emission. President Drew quoted Ban Ki-moon at Commencement, “Global Warming is the defining issue of the age.” Was the Provost AWOL during that part? The other serious problem is that Labor was unrepresented on the Task Force. Much of the work that ‘needs restructuring’ is performed by members of HUCTW. They want to make the Libraries university wide, but did not hear from the largest existing university wide organization in the picture. If you’ve really been paying attention, you will realize that these ‘two issues’ are intimately related. Unlike the ideological left, I do not believe that addressing Labor without explicit consideration of the time-scale of global warming is to have too much in common with capitalism. The report does not recognize that Libraries were invented basically to deal with shortcoming of the idea of private property. Libraries are the common relative to the political economic unit that pays for them. Harvard is chartered by the Commonwealth of Massachusetts and paid for in part, by way of opportunity cost, the citizens of Cambridge, Longwood, and Allston. In fairness, I should mention that, given the current leadership of the union, had they been included in the Task Force, I would probably be complaining about their performance. This is why I am running for Union Representative in the Harvard College Library and Executive Board Member in the FAS Arts Region under the current districting plan. The proposed centralization of the Libraries makes it essential that we redistrict the union so that the Libraries are their own district. I am available for any new positions that may occur due to that. 1. Establish and implement a shared administrative infrastructure. Administrative services that will be markedly strengthened by centralization include many information technology functions; most preservation functions; and certain significant technical services such as acquisitions and cataloging. Translated into labor terms, (with the exception of IT1), there will be less people doing these jobs at Harvard in the future. Add to this remarks like Nancy Cline’s, “were looking at buying catalog records from an outside vendor”. This plan to outsource cataloging jobs will be more likely in a more centralized environment. 2. Rationalize and enhance our information technology systems. The origin of the ‘irrational’ information infrastructure is glossed over. I submit that a big part of the problem has been management afraid of technology and insisting on hiring specialists to allow them to continue operating with minimum perturbation of their own jobs. Rather than using technology to extend their own capabilities, they hire someone to translate old ideas into the new reality. Workers who make the effort on their own to know what’s happening in the wider world are punished or marginalized. In the college libraries, websites sprang up because interested employees thought it would help their organizations. Each one had its own look, but because the information was entered by the people closest to its origin, the were accurate. One of the early moves in centralization was to kill off these examples of Zittrain’s generative internet and impose a top down approach which requires extensive communication off the net to get the sites to be accurate. 3. Revamp the financial model for the Harvard libraries. 4. Rationalize our system for acquiring, accessing, and developing materials for a “single university” collection. Another expression of centralization which if implemented as in the past means ‘out with the old employees in with the new’. 5. Collaborate more ambitiously with peer libraries and other institutions. This recommendation has the potential to be good for a broad range of people including labor at Harvard and the other institutions. Whether good things find there way into reality depends on whether HUCTW can be vastly more effective than it has been in relating to labor at the other institutions. One question the Task Force report does not ask; Why does such cooperation not already exist? Have the libraries at other institutions been reluctant to work with the Harvard Libraries?  Strategic investments must be made in human capital to achieve these objectives and reforms. On its face this sounds good, but based on past experience, I have to wonder if the reality will be a continuation of existing trends – ‘investing’ in new narrowly specialized employees instead of current employees who in many cases are more flexible and able to learn than the managers they work for. I don’t speak for the No Layoffs Campaign, but to me ‘No Layoffs’ doesn’t mean that people will be doing exactly the same thing three years from now as they are doing now. Who wants to be bored like that? It means that learning will be a natural part of work rather than factory style acquisition of commodity training. 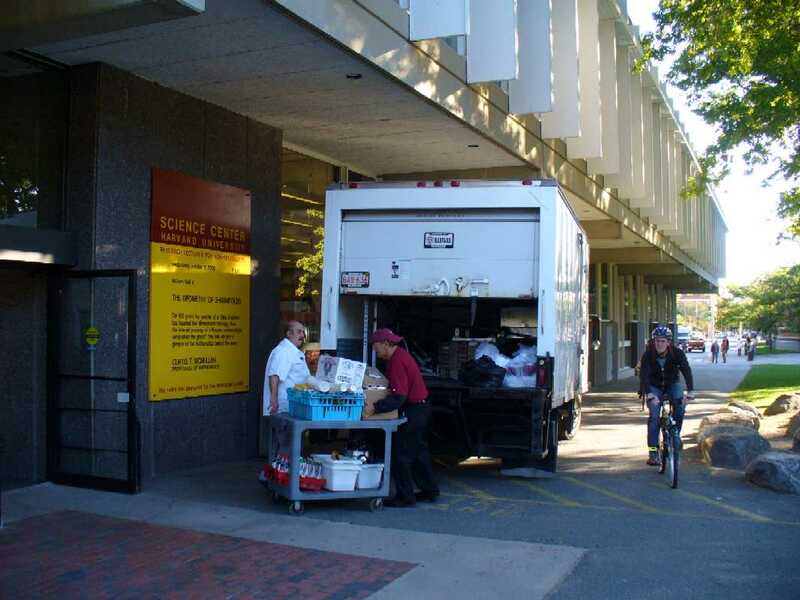 The Libraries specifically and Harvard generally have to commit to it’s employees on all levels. The question of levels itself, I’ll discuss later. 1This phrase, in and of itself, presupposes an industrial model of information infrastructure which I have strong doubts about. 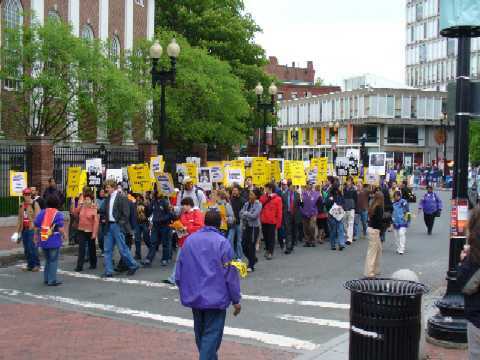 It was the end of 2nd day of the sit-in of Massachusetts Hall in Spring of 2001. Close to 50 members of the Progressive Student Labor Movement had been inside demanding a Living Wage for Harvard Workers. I had been there anytime I wasn’t sleeping or guarding the library. I was talking to Joanne Preston, when I spotted him. He had come in the Johnston Gate and huffed and puffed past Harvard Hall with a small entourage. – Ted Kennedy. He had gotten past Mass Hall when he saw the students hanging out of the windows. Without missing a step he swiveled an obtuse1 angle and headed straight for the windows. His campaign instincts as sharp as ever, he used both hands to greet the students inside. He worked his way along to the front. He marched up to the front door flanked on either side by a uniformed officer of HUPD. He grabbed the handle and had the door open a foot or so when the officer behind stopped it with is hand. The Senator turned to that Officer and said something. I wasn’t close enough to hear. The Senator turned to the other Officer and said something. There were two or three more cycles. I don’t know what was said, but I imagine at some point The Senator said, “What do you mean I can’t go in there, I’m Ted Kennedy.” Even so, he was not allowed in to see the students. He spoke briefly to the crowd, drawing cheers when he announced his support of the sit-in. “I believe we’re going to be successful,” he said as he pinned a living wage button on his jacket. From inside the building, a PSLM member yelled out the window-asking Kennedy whether he would call University President Neil L. Rudenstine to ask for a living wage. “I’ll call him, absolutely,” Kennedy said. I’m sure I remember hearing the voice from inside and I’m sure that Teddy responded without hesitation. I’d like to say I remember whose voice it was, but I can’t. But the student I knew who had the instinct to do something like that was Aaron. Later, local officials and members of the cook’s union would be allowed in to feed the students. The end of the sit-in was a little awkward. PSLM and supporters declared victory from the steps of Mass Hall, while Joe Wrinn declared victory for the administration somewhere else. It was a truly Harvard moment – both sides proclaiming a moral victory. But Havard labor was observably helped by the efforts of PSLM. Subsequent students would spend a lot of time minimizing the accomplishment in favor of what they hoped to accomplish, but never did. Ted Kennedy was no revolutionary, I for one was glad he came. Mary Jo and the intrinsic instability of capitalism2 not withstanding, I was glad he came. 1What obtuse used to mean before it came to mean stupid, but you can see how the meaning developed. 2More evident now that at any time in the history of capitalism. I’ve cited Wall Street types so far so you won’t think this is the sole possession of wild-eyed radicals. But Robert Brenner has been saying this since 2002. If you missed his talk at the Workshop on the Political Economy of Modern Capitalism you can still find the source material under December 8. Update: Graduates shown above were in fact members of SLAM from the Law School. The No Lay Offs Campaign Blog has more complete report including pictures of the rest of the days activity. *My experience has been that commerical internet video players block screen capture software. A word picture will have to do for the time being. I suspect that this will survive into the archival footage. and more from Jason Pramas at OpenMediaBoston. 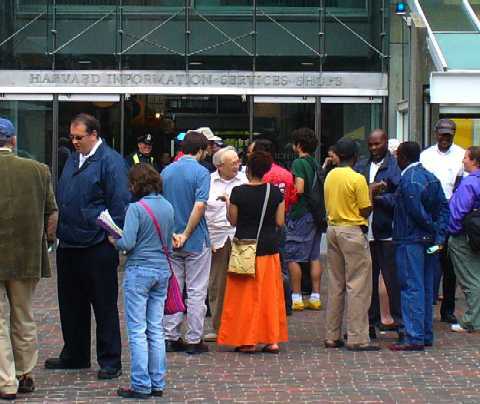 Gathering in front of Holyoke Center after agreement between S.E.i.U. and Allied-Barton was announced March 2007. S.E.I.U Local 615 got a contract agreement with the largest security company in the U.S. 1 – Allied-Barton – the firm which is currently used by Harvard. One axiom of an individual seeking a job, is that your power in what is always an ‘asymmetric relationship’ is at it’s greatest just before you sign on the dotted line. This is also true of unions relative to employers. The job of the union over the duration of the contract is to oppose employers efforts chip away at – if not outright ignore – provisions of the contract. Failing to post job openings so that all eligible union members can bid on them. Awarding hours to new employees in unposted jobs. Posting new employees for ‘training’ without any supervision to train them. They are asking us to join a rally today in front of the Holyoke Center from 3:00 PM to 5:00 PM. I respect and support what they are doing and I will join in their parade. 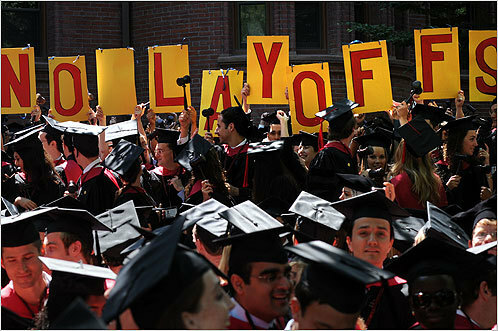 However, I do think that Harvard’s Labor Left has not yet found the best path. For the Harvard community to pressure adminstration to perssure Allied-Barton management is at best oblique. Consider what the purpose of outsourcing is in the first place. But, Lest that be called rain, I will render it after the parade. 1I have deliberately excluded from this, Blackwater, Dyncorp and their ilk who I would call private military organizations. 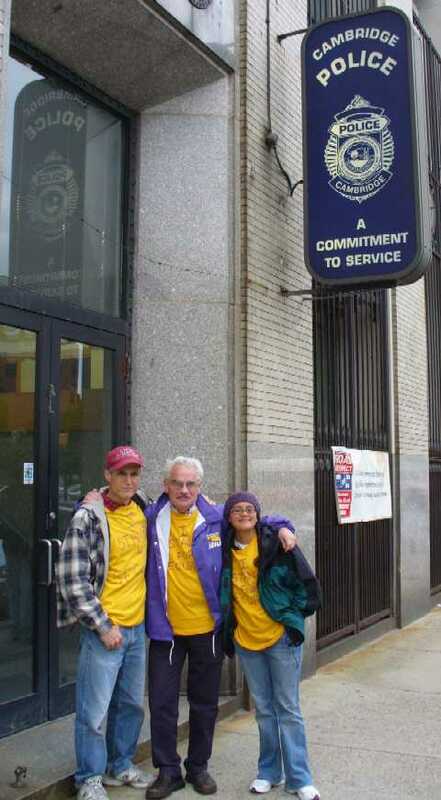 2We need to get these folks more in tune with the other part of SEIU615 i.e. Harvard’s Custodial Workers. One thing at a time I guess. All the leaves are gone. But the sky is gay. While the students are away. but I’m told he’s a hell of a preacher, if you’ll pardon my french. 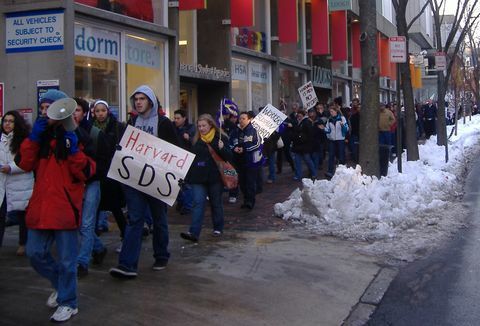 After rally at Harvard’s Holyoke Center announcing tentative settlement. At a brief rally1 in front of Harvard’s Holyoke Center, negotiators from S.E.I.U. local 615 announced a tentative settlement with Allied-Barton, the company which increasingly supplies contract security guards to Harvard. No details were provided pending ratification of the membership. Union members will now vote in shifts and sometime next week, we’ll know. 1So brief that I only caught the aftermath what with lunch and Tealuxe and all. 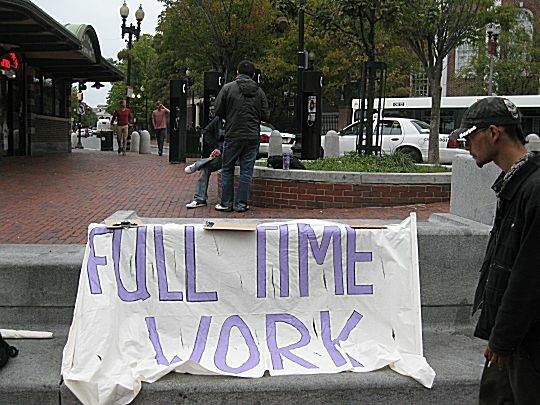 Online at The Spring 2001 occupation of Mass Hall by the students of the Progressive Student Labor Movement[PSLM] brought some improvement to the lives of some of Harvard’s lowest paid workers. Included in the settlement that ended the occupation was a temporary and limited respite from the steady trend over the last 35 years to outsource and deunionize labor at Harvard.1 The group had a number of significant assets and some luck. They had been steadily at work for four years – greater than average continuity for student political groups. They were members from Law, the Kennedy School, Medicine, and Public Health, as well as graduate and undergraduate students from Arts and Sciences.2 A student doing “worker outreach” spoke to me at the guard desk of the Lamont Library. They had a fairly vibrant organization with fairly broad recognition on campus, when they had some luck. 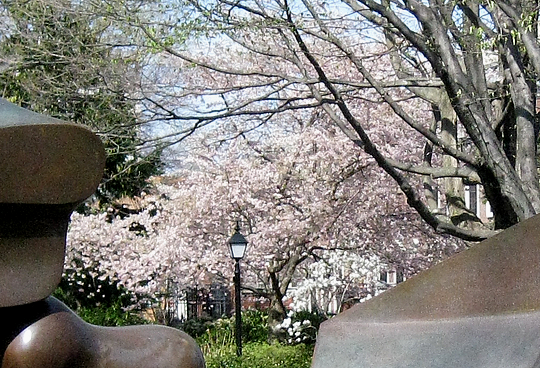 President Neil Rudinstine announced his retirement in the spring of 2000. Going into the fifth year of PSLM, I was invited to a meeting in the Parlor Room of Phillips Brooks House. It was full about 50 people; surprisingly close to the number that went into the occupation. There was a steady stream of events involving a coalition of three groups of low wage workers. Cooks – some “direct” Harvard employees represented by Hotel Entertainment and Restaurant Employees and some working in “cash ops”. It was an explicit goal of the campaign that these contract workers should be “direct employees”. 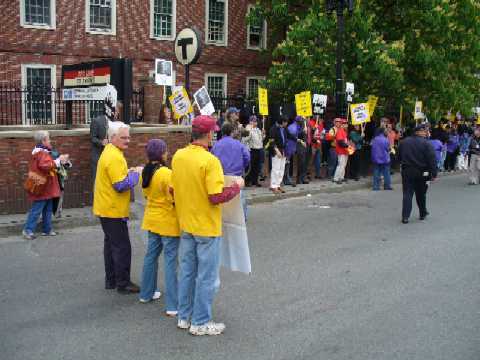 Custodial workers, some “direct” Harvard employees represented by Service Employees Internation Union Local 615 and some employees of cleaning firms under contract to Harvard. It was an explicit goal of the campaign that contract workers should be “direct employees”. Then there was the occupation. For twenty one days close to fifty people inside Mass Hall and anywhere from 300 to 1000 outside. Radical groups and mainstream politicians came in support.3 It was an inclusive effort. Nonetheless, as I’ve said, it did not achieve all of it’s goals, but they did achieve measurable success. There were, I’m sure many things went on behind the scenes that would have made me wince had I known. Still, I think there is only one thing I would criticize. They did so many things well that they made it look easy. Incoming students never quite got it. There was among the newer students a desire to outdo their predessors. They wanted to acquire the assets of PSLM, but “rebrand’ the organization to a more explicitly radical mold. And the leadership was largely First Years and the group undergraduate. It made a difference. They were very late to learn that in the abscence of the ‘guaranteed’ secular apolcalypse a successful radical action involves a lot of boring non-radical work. The result was an effort smaller and less significance than the effort they were determined to outdo. 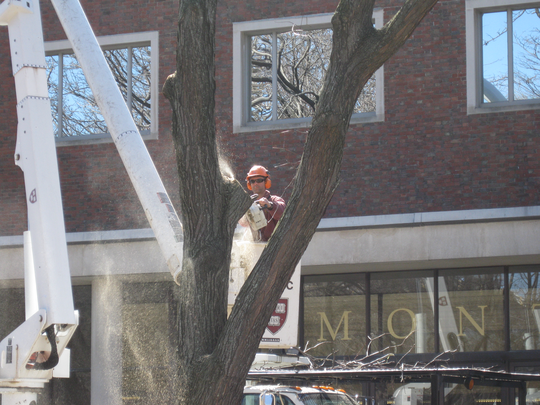 This has left one significant downside for Harvard Labor. The contract Security Guards, with community support, will probably get a reasonable contract with Allied-Barton. 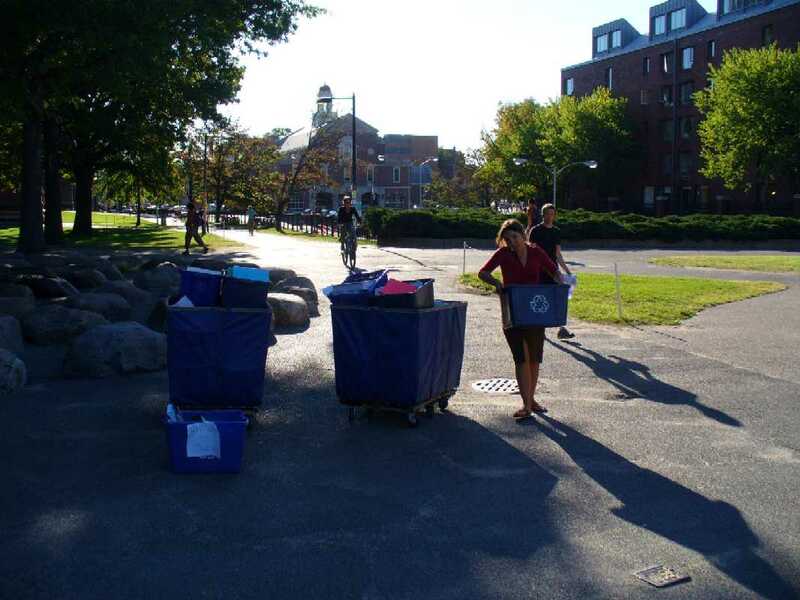 But the Student Labor Action Movement has left the door wide open for Harvard adminsitration, at the end of that contract, to simply go to another, lower bidding, non-unionized vendor. 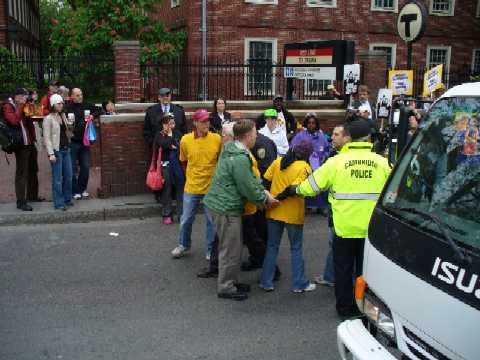 This may be good for SEIU in the long term, but the particular guards at Harvard now will have their lives disrupted. Further, the guards in HUSPMGU and my library guards are probably more vulnerable to outsourcing than before. This is admittedly a rearguard action, a genuinely progressive program for labor has yet to emerge.6 But secular apocalypse is so notoriously unpredictable that in the current historical circumstance the misestimation of its imminence is creating a lot of disjoint pockets of heat and not a lot of light. 1Coworkers who were at Harvard before me say that the painters were all “let go” in the early ’70’s. 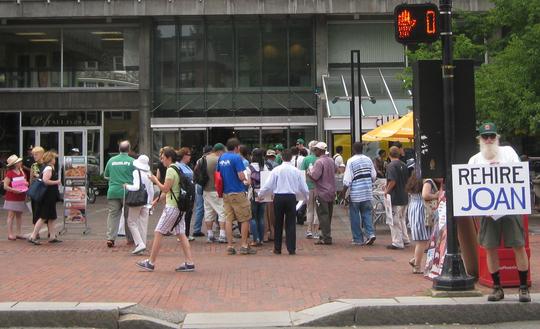 That’s just about the time that the Harvard Union of Clerical and Technical Workers [AFSCME local 3650] was formed. 3I would like to have heard the discussion when the HUPD officer explained to Senator Kennedy that he was not allowed in to see the students. I was rather proud of the Senator’s performance. 4The Late Larry Summers had no legacy to protect when he shuffled off this mortal coil. As I’ve mentioned previously, there are cases where mortality and departure from Harvard are the same. There do, hovever, appear to be backdoor attempts by the Fellows to partially resurrect him. The legacy of a second time President who, despite a background in labor, presided over the beginnings of union busting at Harvard is harder to calculate. It is doubtful that SLAM is able to do, let alone take advantage of, such a calculation. 5This is actually easy to do. 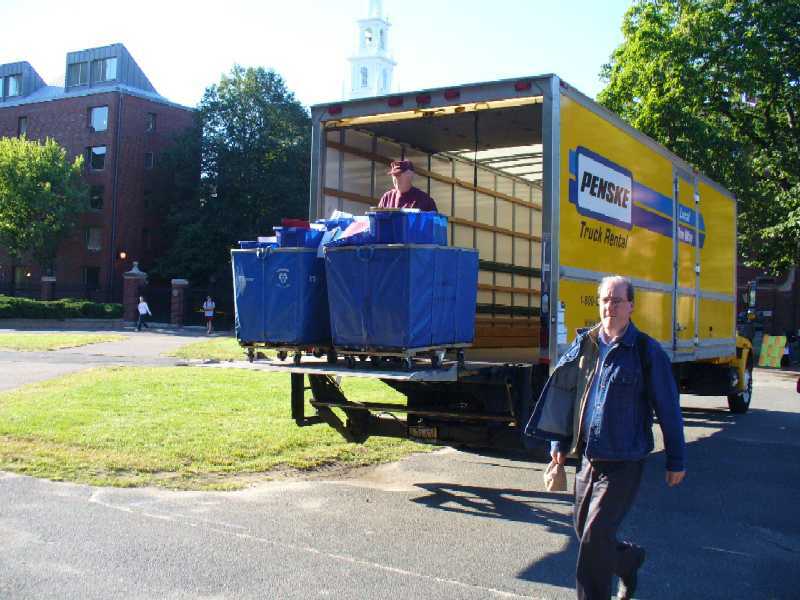 Harvard could negostiate a rent-to-own agreement with Allied-Barton. SEIU is constrained by law against such a demand, but the community at large is not and the students in particular could raise this with impunity. I once heard the argument advanced that Harvard Human Resources couuld not find guards at the then going rate of $11.50/hour which required using S.S.I. who could find guards at the then going rate of $9.00/hour. Administration clearly didn’t check with Harvard economics on that one. 6There are some encouraging movements on the scene e.g. Participatory Economics and the Free Software Movement. Participatory Ecomomics seeks to be general, but has limited “mindshare’ at the moment. Free Software is restricted in the activities it covers, but it has achieved significant “marketshare”. Micro$oft may dominate the personal computer, but Apache software has dominated the webserver space for years. Both movements explore how to spread advanced modes of production beyond the privileged few. And they are not locked in to a specific prediction of a secular apocalyptic event. They are achieving results now! 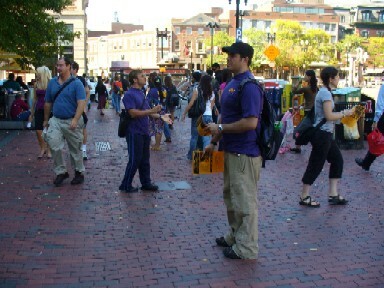 SEIU 615 and supporters rounding the bend in front of Lehman Hall, Harvard Square. The guy in the red hat is Steve Meachem, one of Cambridge’s establishment radicals. I believe he is a necessitarian, but I respect him. When not being arrested he works very hard to help people in very direct ways – without fanfare. I’m somewhat of a nominalist – ideas are not ends in themselves; they are tools. I met Steve through Eviction Free Zone. Not a bad group. Tom Potter was shouting something at Emerson Harris. O’brien was already gone. She was coming in Johnston Gate as I was going out. They are competing necessitarians. The person in the green dayglo hat is a Lawyer’s Guild legal observer. The man standing to Steve’s left, Jeff Feuer, is also a legal observer but he’s wearing a black hat. Dude! You’re out of uniform! 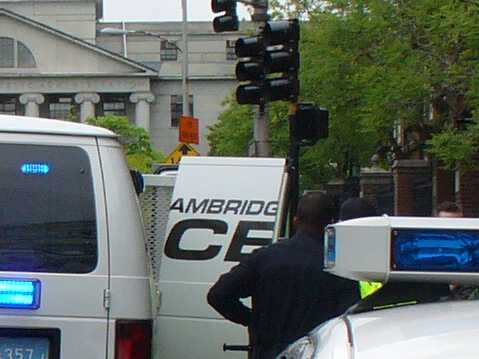 Doesn’t matter, I’m sure all the cops – Cambridge and Harvard – know who he is. I was too slow, but they were put in the wagon. on their release from Cambridge Police Station. HUCTW: From each according as she is able to each according to her needs. Impossible dream? Perhaps. But an experimentalist must always ask the question: “compared to what?” The Pareto idea rejects policies that disadvantage anyone no matter how well off. It is extraordinarily hard to engineer in practice and has known logical limits. [Discovered in part by Ken Arrow who was at Harvard for a time.] Yet classical economics claims to be optimally fair. I don’t buy the premises. And I’ve done field work. Aside from the exclusion of the majority of humans [he used ‘he’], Marx’ idea is eminently worth keeping in mind. I have never seen it made to work without compromise. The point is to be honest about what compromises you are making. The road to narrow sectarianism is paved with ideological purity. Unions are by nature creatures of the left, but to date they have always been part of organizations dominated by hierarchy. In theory, unions are free to choose any organization the membership sees fit. In practice, management can and does influence these decisions. Unions are also regulated by federal law. Knowing what the law actually does depends on who controls the means of enforcement which is divided between the the executive and the courts. The national labor relations board and the department of labor are the two most significant bodies of the executive. 35 years of the rule of the right has left a definite footprint on these bodies and the courts. My difference with both the current ‘leadership’ of the union and the ‘group variously known’* is in the details of challenging this aggregation of power – how? when? for what purpose? at what cost? In the late 60’s most large corporations* changed their pension plans from defined benefit – the employer guarantees a specified level of retirement benefits – to defined contribution – the employer guarantees a specified level of money applied to investment funds. Harvard, despite a substantially different business model, followed suit. * In the heady days ending in 2001, this seemed like a win-win for management and labor. Subsequent events have shown the down side – a massive transfer of risk to the retirees. As the attack on pensions continues in the ‘private sector’, I think we should wonder if Harvard will adopt some the business practices du jour. I propose we ask Dr. Beeferman. If elected, I promise that he will get a good hearing with the negotiating committee. *This is a whole nuther can of worms. Large corporations are “private” in the sense that the “owners” – the stockholders – get to keep the profits**. They do pay taxes. Havard on the other hand is explicitly mentioned in the Constitution of the Commonwealth and does not pay appreciable taxes***. **after a hefty slice of ‘executive compensation’ is chopped off. ***The so called Payment in Lieu of Taxes [PILOT], compared to a ‘private’ business is pennies on the dollar of assessed value. The taxpayers of Cambridge pay a substantial opportunity cost, yet Harvard, when administration finds it convenient, regards itself as ‘private’. HUCTW: The Behavioural Economics of Using and Choosing New Software. Macroeconomics is the study of economies no smaller than a nation-state. Microeconomics is alternatively known as The Theory of the Firm. Both of these rely on assumptions about how people make economic decisions and make claims based on aggregate measures of bunches of people. Behavioural economics purports to measure how individuals actually behave in “the market place”. The idea that economics could be based on empirically determined behavior rather than high altitude assumptions is encouraging. One wonders what took them so long. Complicating the problem of observation vs. assumption is the fact that the object of study – the economy – is evolving at least as fast as ‘progress’ in understanding it. For example, there is one really, really significant change since Adam Smith analyzed the making and using of pins – as in sewing. It’s a lot harder for a person to figure out if a piece of software is going to do her any good than it is for a sewing pin. It’s a lot easier to get another kind of pin if the first one doesn’t work out. Most importantly it takes a lot longer to learn to use it effectively. Suppose I’m comfortable using one program. How do I know when, if ever, a new program will pay me back in productivity and convenience for the time I must spend to learn it. It’s not easy even for people with technical degrees and experience in the software business. HUCTW: new technology and the older* workers. Like everything in the real world economics** the rapid pace of technological advance is a boon to some and bane to others. When I was knee high to a cyclotron,*** I read Norbert Wiener‘s The Human Use of Human Beings. He realized early on that automation would have profound effects on the world of work. He went to the unions to warn them. He was not well received. In the days of Wiener, automation largely affected manufacturing. Surely it would never reach the knowledge industry, right? Surprise! The world of knowledge work is changing as rapidly now as manufacturing did during the Industrial Revolution. Harvard has a highly mixed response to this. Unsuprisingly, the science and engineering departments have embraced much of this change. Surprisingly, the Classics Building has a very nice looking computer center. We in the infrastructure, the Havard Union of Clerical and Technical Workers, have a somewhat different problem. The administration, not the market, has reserved to itself, the right to determine how technology will change our lives. Sometimes we are told that we can’t use new technology, sometimes we are told the we must, and sometimes we are told that technology means that we are no longer needed. I have a lot more to say, but I have to do some life support activity. I’ll discuss the nanoeconomics of technological change. i.e. why people who think Version x.y.z of Eudora was just fine are not nuts. In the mean time. if you missed my previous posts they’re flipped to private by still on the server. HUCTW:Much ado about not much. I always have a lot of “works in progress” like, My Heart is on the Left. But Tru is half right when he says that all an artist has is his life. The whole truth is that’s all any of us have. Be a work in progress. It’s a good thing. *Actually, I would like to include younger workers with a Luddite bent in this conversation. **As opposed to Planck scale economics in which picking the right standard alleviates the need for any engineering. Some believe in Pareto Optimality and voila they are in the best of all possible worlds. Most of them are bankers, CEO’s, or economists. Others incant, “From each according as he is able to each according to his needs,” and think they are surely destined to lead the way to the promised land. Me? I think we should build the future together. In overwhelming likelihood, it will require engineering. Step one would to include the sisters of Xanthippe in the above nostrum. Sadly Wikipedia does not yet know the best story about her – related by Carl Jaspers. Did you ever wonder how Socrates could afford to hang out in the market place being all Socratic and stuff? ***They’re about the size of a refrigerator these days. ****I once had a bad bit in THE accumulator of my PDP-8. That bit required a 4″x 6″ printed circuit card. HUCTW: The light dawns on Marblehead. We DO have an online HUCTW election announcement. I still remember the summer of 2001. It was Friday evening I came home to find the notice of the contract ratification election for the FOLLOWING TUESDAY! That meant ONE DAY to campaign! So we’ve made some progress to a more open Union. Did my nudging help? After the 2001 contract election, it was more than a year before the full text of the contract was made available to the members. In fact, the election for officers was held before the full contract was shown to the membership. There was no informed discussion of just how well the officers had done before the election. Hopefully this time around we can remedy that as well. The HUCTW website [and for that matter the OpenHUCTW website] are both broadcast style. The few [I’ll quietly avoid the adjectives ‘brave’ and ‘proud’] talking to the multitudes – top-down or Read-Only culture as Larry Lessig says. A Union should be bottom-up, many-to-many, or Read/Write culture in Lessig’s terms. We have, after 5 years achieved a Web 1.0 website, but there is abundant Web 2.0 technology available. The exact choice depends on knowing our membership. Personally I find Wiki’s as in Wikipedia an encouraging technology. For example, if you open my Wikipedia user page and the accompanying “edit this page” entry, you can flip between the presentation and the markup that generates it. You don’t actually have to know wiki markup to edit. Find something that does what you want and copy it. Go ahead! Try it! Leave me a message! I The system keeps ALL the backup copies! So I have made quite a few edits, but I don’t actually know wiki markup. I have to admit though that I have had a lot of years of experience with software, so I may not understand how hard it is for others. If that’s the case, we could use a slightly older technology – the discussion forum. It is not harder than e-mail and it has the advantage that all the different contributions are in one place rather than sprinkled through your inbox. But, this summer at Wikimania2006,a prototype of Wysiwiki was presented. You don’t need to know markup at all. It’s like Micro$oft Word where “What You See Is What You Get” except it makes wiki pages rather than printed documents. I’ll regale you with the events of 2004 tomorrow including the raise that was not a raise and why Donene thinks none of y’all should burden your pretty little minds with the Consumer Price Index. 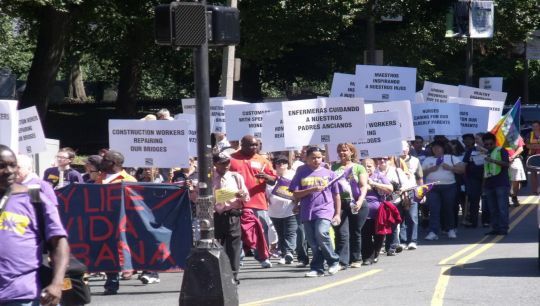 Harvard fires janitor for fainting; SEIU protests! Members of Service Employees Internation Union Local 615 distributing flyers for Friday’s support rally for Saintely Paul. Saintely Paul has been working in the William James Hall for Facilities Maintenance Operations (FMO) for the past 6&1/2 years. He was fired at the end of June after he fainted at work. Havard refuses to rehire him despite medical documentation of his treatment . Upon firing, Saintely’s health insurance was taken away. Rally with janitors, politicians, students, and faculty! Tell him that Harvard janitors deserve better treatment. Demand that Harvard reinstate Saintely Paul with back pay and cover the medical expenses he has incurred during this period. This is not a request to cease services and deliveries. No dispute with any other employer. *handing the President’s email address to spam-bots is counterproductive. Carrying tubs of used course packs. for the Habitat for Humanity book sale. which is in turn part of the Change to Win Coalition. But if my most favoritist reactionary string theorist, Lumidek claims that course packs are expensive because of the Unions, he will be wrong! Most of the cost is licensing that intervention in the ‘free market’ that the right-wingers love so much – copyrights. 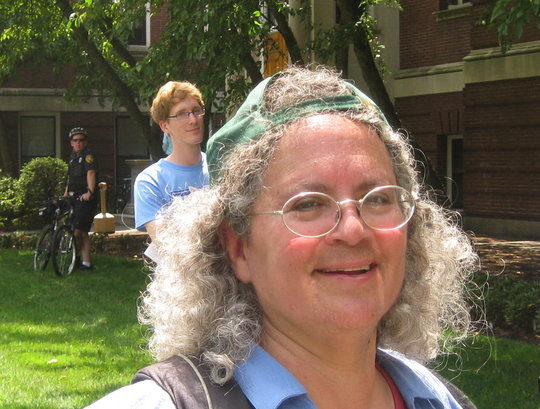 | Richard Stallman appeared briefly at the Wikipedia conference at Harvard Law this summer. Given the significant differences between copyrights and patents, he asked whether the concept of intellectual property has any ontological basis. It is, he asserts, merely a tool to legitimize business practices that benefit the few at the expense of the many. …with Jim from FMO helping out… …while the folks from HUDS get ready for their day. PBS together with Democracy Now! have produced a three part series about the living wage. The first installment is about Walmart and Chicago’s ‘Big Box’ Ordinance and in the Boston market airs tonight at 10:00 PM on WGBH 2. Transcripts and audio are available on the PBS website. Mostly I work in the Economics building. [Downstairs from Andrei Schleiffer in fact.] It is right next to the Law School. Accident? You can believe in accidents, but if you believe in accidents, science ceases to exist. Economics, in the capitalist paradigm, can’t exist without legal definitions and enforcement of property. It was interesting to hear someone talking from the Law side. Mention pro and con of Austrian free-market economist Friedrich Hayek.